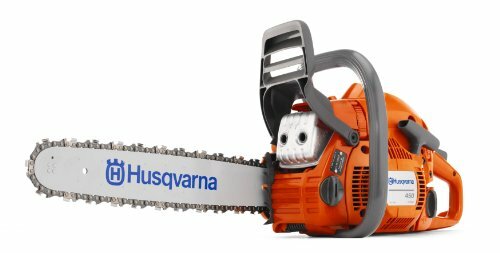 →Which is the best medium sized gas-powered Husqvarna chainsaw? Both these models will work very well for the landowner, farmer or rancher but have different strengths depending on what you need a chainsaw for. With the 18” Husky 450 you have a light but rugged saw that can tackle most medium duty jobs and handles well enough to be used for tasks requiring extended use without causing too much fatigue. The 20” 455 Rancher, on the other hand, is more of a heavyweight that has the power to tackle demanding jobs but is maybe too heavy for lighter duty tasks such as limbing and pruning. Which is the best medium sized chainsaw? Even though we’re comparing these as an 18” model versus a 20” model, both chainsaws can take a variety of bar and chain lengths making them versatile machines that could be used for different tasks more suited to a shorter or longer chain for example. The best way to see what each saw has to offer is to list out the main features and specifications so you can compare them side by side, which you can find in the table below. Engine 50.2cc 2-stroke X-Torq. 55.5cc 2-stroke X-Torq. Fuel tank 0.95 US Pint. Visible fuel level 0.93 US Pint. Warranty Residential 2 years. Can be extended by buying premixed fuel at the time of purchase. Residential 2 years. Can be extended by buying premixed fuel at the time of purchase. We have in-depth reviews for both these models as well as other popular brands and sizes on our website. You can find the full reviews by following the links here for the H﻿﻿usqvarna 450 review and the Husqvarna 455 Rancher revie﻿w﻿ here. Note that even though the bar and chain size may vary in some of our reviews, the power head unit remains the same. The 455 Rancher has a larger and more powerful engine than the 450 which gives it an advantage in terms of the raw power available to tackle the more demanding jobs. Both models have the X-Torq type of engine that provides for better fuel economy and reduced emissions. This is a 2-cycle or 2-stroke engine that requires a gas/oil mix as fuel which on the Husqvarna range is mixed in the ratio 50:1. The 450 model has a 50.2cc engine that develops power of 3.2 hp at a maximum speed of 9000rpm whereas the 455 Rancher has the 55.5cc engine with a power output of 3.49 hp. The maximum engine speed is the same as the Husky 450 so as a direct comparison, the Husky 455 Rancher is a clear winner. The chain provided for each of these models is a different length obviously and on the 455 the pitch is the larger 0.375” size which can make a positive difference when cutting. Both are low kickback chains that are good quality, but of course are easy to swap out for a different brand or type if required. As we mentioned earlier, you can fit a different bar/chain length in either model with both taking a maximum 20” length. The 450, however, can take a smaller 13” length which given its light weight, makes it ideal as a light duty machine. Overall, the 455 Rancher is better in pure power and performance, but the 450 certainly has some things going for it, especially if you prefer a lighter weight saw. This does seem to cause some confusion. The Husqvarna 450 and 450 Rancher are one and the same. The term "Rancher" is what is used by Husqvarna as a title for a range of tools. The Rancher range includes the 450, 455, 460 and 465. It does seem that the Husqvarna naming and numbering convention is confusing a lot of people, as does their website. Both chainsaws have many of the features that help make starting a lot easier and more dependable than is common on some 2-stroke engined chainsaws. Researching the experiences of users indicates these work well although there are some isolated reports of starting problems as you might expect. One thing the 455 Rancher does have that is not present on the 450 (at the time of writing) is a decompression valve and that really improves the experience especially with the larger engine. For that reason, we feel the 455 is going to be a better choice if you’re worried about problems getting the chainsaw started. Husqvarna has developed a neat system that pre-cleans the engine air and this is fitted to both these models. It uses the cooling fan to provide a centrifugal force that pulls out larger particles of dust and debris before it even reaches the air filter, reducing filter maintenance and improving engine life in the process. The lighter 450 model also benefits from tool-free access to the air filter which makes cleaning it very quick and simple when you need to. The 455 has four captive screws that need undoing to get at the air filter which is less convenient, unfortunately. One benefit the 455 does have though is that the cylinder cover can be adjusted for running the chainsaw in cold weather, with preheated air from the cylinder being diverted into the air path to prevent icing up of the filter etc. With the same air filter fitted there are pros and cons for both models, so we will call this one a draw! Like most modern chainsaws these days, both models are fitted with some safety features to help protect the operator if some mishap should occur. The biggest danger is when kickback occurs and together with the low kickback chain, these models are fitted with a chain brake system that is operated either by the front hand guard or through the inertia created when the bar kicks back. You also have a chain catcher and a rear handle design to protect against a broken or dislodged chain. Some chainsaws come with a bar fitted with a safety guard at the tip, but neither of the Husqvarna models has this, unfortunately. If you require a spark arrestor in the muffler then this is available for both these models, check with your supplier to see if it is fitted before purchase to be sure. As both models have the same safety features there is no winner in this category. Always ensure that you are using the best in protective clothing, and also make sure to wear chainsaw chaps and boots. If you have never heard of a condition called HAVS or vibration white finger then you need to be aware of it, especially if you use chainsaws frequently. This condition is caused by the vibrations experienced through the handles when holding the saw and modern saws usually come with some sort of dampening system to counter the problem. Husqvarna has one of the best systems around which they have called LowVib and it reduces the vibration on both these models to quite low levels. They are both very similar so there is no clear winner and you will find either saw much more comfortable to hold than some competitors. As we mentioned above, there is quite a difference between these two chainsaws in terms of weight with the 450 coming in at nearly 2lbs lighter than the 455 Rancher. That’s quite a difference and is one of the main factors you will need to consider when choosing your preferred model. The fuel capacity on the 455 Rancher is very slightly less than the 450 but more importantly from a usability perspective, it does not have the visible fuel level window that the smaller saw has. It’s surprising really for a more expensive saw to not have that basic feature, but that’s how it is on the current model so something to bear in mind. To make up for it a little, the larger machine actually benefits from a better fuel consumption rating so, in theory, will last you a little bit longer between fill ups. Even so, we think the 450 wins out in this category over the 455 Rancher. The Husqvarna warranty on all their chainsaws is standard across the range with 2 years cover for residential use and 90 days for commercial. Something to remember when purchasing your Husqvarna saw is that you can extend the residential warranty by a further 2 years if you buy some branded premixed fuel at the same time. This must be on the same receipt and is a great way to get additional peace of mind for not much cost. There are quite a few differences between these two models so it’s important you know the type of work you will need it for overall before deciding. 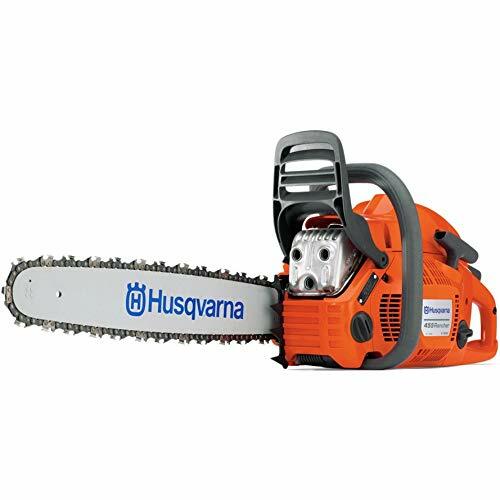 Just to recap, if you need a lighter chainsaw that can be used throughout the day without causing too much arm fatigue then the Husqvarna 450 is going to be your best choice, particularly if you will not be using it for lots of heavy duty type tasks. However, if you need something that can tackle demanding jobs requiring more power then the Husqvarna 455 Rancher is the model to go for. Many users find this has the best balance of weight versus power for this type of work and is very popular amongst folk with large plots of land to look after, especially if you have lots of wooded areas. Whichever model you go for, both will provide you with excellent service if looked after properly and used in accordance with the user manual provided. Check for the best deals on these chainsaws by clicking the button for each model below.